Immerse yourself in premium sound and multi-dimensional audio with the Marantz SR6013 9.2 channel AV receiver. It features Dolby Atmos, DTS:X and DTS Virtual:X decoding for immersive home theater, and proprietary HDAM circuit boards for more detailed, dynamic sound. Eight HDMI inputs are fully compatible with the latest specifications, including 4K Ultra High Definition video, 60Hz video, HDR, Dolby Vision and Hybrid Log-Gamma. Listen to all your favorite music from your smart devices via Bluetooth, AirPlay or the HEOS app. Control the SR6013 with your voice and Amazon Alexa — download the HEOS Home Entertainment skill and ask Alexa to play, pause or stop music, switch inputs for your different media players, turn up the volume and more. Featuring discrete high-current power amplifiers on all channels, the SR6013 delivers 110 watts of power per channel (8 Ohm, 20 Hz - 20 kHz, 0.08% 2ch drive). With low impedance driver capability, it offers operational stability with a wide range of speakers for balanced, quality sound. Auto Eco Mode adjusts power output to speakers based on volume level and on-screen eco meter, providing power consumption reduction in real-time without sacrificing superb Marantz sound. Includes eight HDMI inputs — with one HDMI input on the front panel for quick connection — each one supporting HDCP 2.2, 4K Ultra HD 60Hz video, 4:4:4 Pure Color sub-sampling, Dolby Vision, HLG, High Dynamic Range (HDR), 21:9 video, 3D and BT.2020 pass-through. The video processor is capable of upscaling SD and HD video to 4K Ultra HD. Three HDMI outputs allow you to connect to multiple zones and run a TV and projector at the same time. Immerse yourself in multi-dimensional audio with the latest surround formats, including Dolby Atmos, DTS:X and DTS Virtual:X. DTS Virtual:X provides immersive audio without height channels, creating virtual height effects in a 5.1, 7.1 or 2.1 speaker arrangement. Enjoy hands-free control with Amazon Alexa and your voice. Adjust the volume, skip to the next track, switch inputs for your different media players and more — “Just Ask.” Download the HEOS Home Entertainment Skill to enable Amazon Alexa voice commands for SR6013, HEOS devices and other select Marantz products. eARC (Enhanced Audio Return Channel) supports the transmission of 3D audio from your TV apps with a single HDMI connection for the simplest setup. The feature will be enabled via a future firmware update. 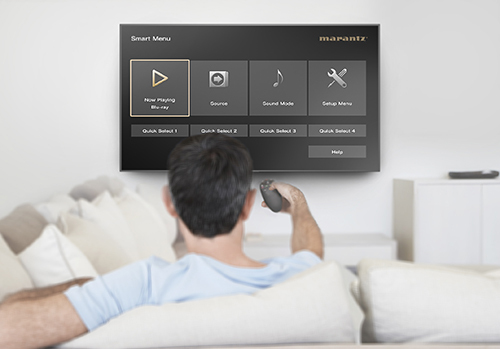 The Marantz 2016 AVR Remote app provides unprecedented control over the latest generation of Marantz network AV Receivers. Control power, volume, input and settings, or switch to the HEOS app to access an incredible range of music content and streaming services. Download available for iOS and Android phones and tablets. The SR6013 features exclusive Marantz Hyper Dynamic Amplifier Module (HDAM) technology that provide ultra-fast slew rate, true wideband performance and maximum dynamic range for optimum sound quality. Current Feedback technology, first introduced by Marantz more than 60 years ago, replaces voltage feedback configuration that’s typical of AV receivers and delivers wide, closed-loop bandwidth and steep slew rate for superior fidelity with wideband audio sources. The HDAM component of the Marantz SR6013 outperforms op-amp solutions due to its high speed and maintains a clean audio signal for exceptional sound performance. Equipped with the full Audyssey Platinum suite of advanced DSP algorithms, the SR6013 features Audyssey MultEQ XT32 automatic room acoustic correction. With the supplied measurement microphone, MultEQ XT32 analyzes each speaker's output (including the subwoofers) at up to 8 measurement locations and generates precision digital filters that optimize each channel for the correct frequency and time domain response. Audyssey Dynamic Volume smooths out disruptive jumps in volume (such as TV commercials), letting you listen at lower levels while still enjoying clear dialogue, music and sound. Audyssey Dynamic EQ provides full-range clarity at any listening level, and Audyssey Low Frequency Containment uses advanced psychoacoustic algorithms to deliver a full-range balance, including deep bass, without disturbing neighbors or people in other rooms of your home. Audyssey Sub EQ HT provides individual DSP tailoring of each subwoofer in a dual subwoofer setup for deeper bass with improved definition. Plus, the Audyssey MultEQ Editor app lets you view and adjust settings for detailed tuning and customize the sound more precisely to your room and tastes. The SR6013 features external control and IP control capabilities for easy customization and compatibility with third-party integration solutions. It offers IP control capability for major third-party control devices, as well as Control4 SDPP (Simple Device Detection Protocol) certification for seamless integration with Control4 home automation equipment. An IR (infrared) remote control is included on the rear panel for remote control compatibility with other components in your home theater system, and remote monitoring capability is now supported for troubleshooting. Watch a movie in one room while another family member listens to a CD in a different zone without interruption. Enjoy 7.1-channel surround sound in the main room and a separate source or music stream in another. Connect a pair of stereo speakers to the multi-room amplified outputs or hook up a separate stereo amp and speakers to the Zone 2 pre-outs. Easily control the receiver with your Smart TV remote via the HDMI CEC functionality associated with your Smart TV. 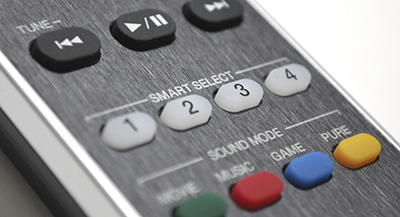 Simply set “HDMI Control” to ON in your receiver, then set “Smart Menu” to ON and begin controlling the SR6013 with your TV remote. The Smart Menu home screen gives you quick access to source and surround mode selections, the AVR's setup menu and four Smart Selects. The SR6013 Quick Start Guide provides simple, direct instructions to get started. Once you connect your TV to the SR6013 via HDMI, the Marantz Setup Assistant appears on your TV screen and guides you through setup. The Setup Assistant helps you establish crucial settings for the best possible sound quality, whatever your configuration. Founded in 1953, Marantz has a long and rich history of designing audio components embraced by music lovers and critical listeners around the world. Because Music Matters, the SR6013 carries on our long tradition of delivering a best-in-class listening experience for music and cinema.